Our toddler, E, is running up the steps and zipping down the playground’s small slide on his stomach. Our newborn, B, is strapped to my chest, a heater pack on a hot fall day wiggling from time to time, threatening to wake up before I have time to run home for his bottle. We need to head home soon. I hear her before I see her. When I do see her, I can hardly take my eyes off her. Maybe five or six years old, she’s running behind her father who is five paces ahead and engrossed in a call on his smart phone. He’s muscular, wearing a perfectly fitted shirt and what I imagine to be designer shorts. It’s as if he’s walked out of a catalogue and onto a playground where a little girl started chasing him. He only acknowledges her when her shouts are audible for everyone within a few blocks. “What? What’s wrong?” he demands. If he’d spent ten second listening to her shouts, he would have known. He nods and says, “Yeah.” With that he turns away from her and resumes his phone call. He may as well be a mile away. 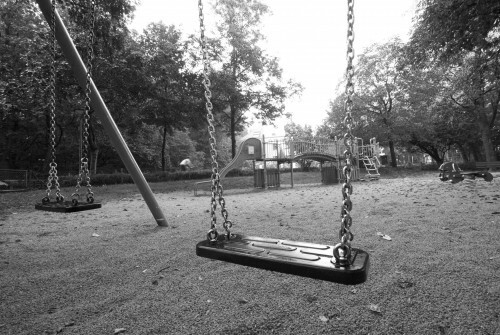 Resigned, she stomps over to the swings and glides back and forth on her stomach, staring down at the mulch. A few other kids her age are wrapping up a game of tag and catch her eye as they charge past her. I see her loneliness and heartache, and I feel the challenge of my position as a man. I don’t want to be that creeper guy on the playground who goes over and talks to random little girls, you know? But her loneliness and perhaps even fear strikes a place deep within me from the past. And I know that pain, and pray out of that pain that God would send someone to see her, to pay attention, and to let her know how wonderful she is. But then B starts to squirm, and E gets that mad dog look in his eyes that portends both hunger and exhaustion converging, and I have to let my boys know that I see them. I have to go, luring E back to the stroller with promises of peanut butter sandwiches and crackers. The other kids and their families hop onto their bikes or retreat to their cars. It’s as if we’d all agreed to leave once this girl set foot on the playground. The man continues talking on his phone. E babbles to me about crackers and this sheep bath toy that I know we’ve lost during the walk. B makes a “sqwicking” noise as he settles into his pacifier. The girl rocks on the swing, back and forth, back forth—alone.